Today's adorable image is from Crafts4eternity for the challenge over at Artistic Inspirations Challenge. I added some googly eyes from my stash to give her more character. And of course I had to add bling somewhere so I added it to the cupcakes with Stickles diamonds. 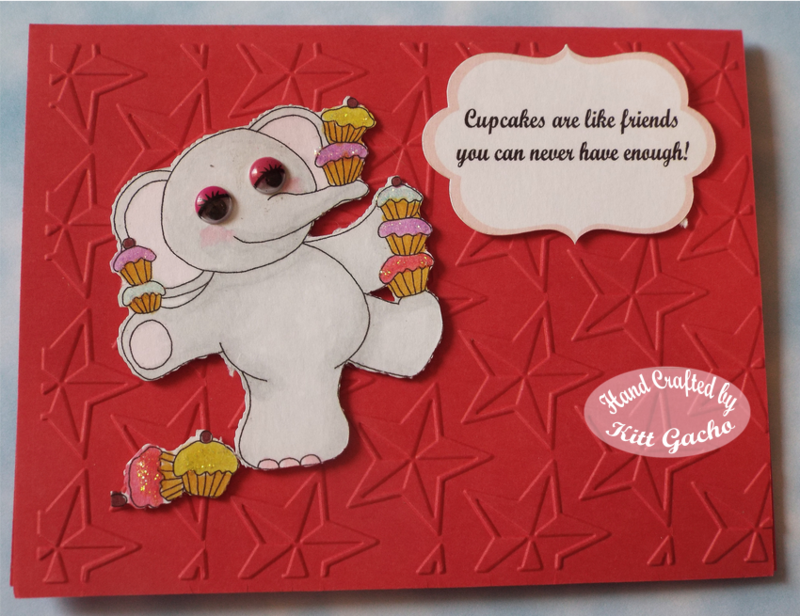 The back ground was embossed with Cuttlebug Stars folder. Both the image and the sentiment was mounted on pop dots and cut with the Silhouette Cameo. And what kind of a project would it be if I didn't use my Spectrum Noir markers. LOL. Thanks for stopping by today and leaving your kind comments. I'm looking into moving my blog, follow me for updates. Have a happy crafty day. Who doesn't love a yummy cupcake? Love the bright red embossed background too! Adorable card! Love the cute image and the googly eyes! Congratulations to Artistic Inspirations on their 100th challenge! Fun blog hop - thank you! Very cute card. Love the star embossing! Thanks for joining us at Great Impressions for our Animal Friends Challenge. Happy 100th. This elephant has good taste. The embossing you added looks great. I wonder if there are any cupcakes to share? Very cute card and I love his sleepy eyes! What an adorable card . . . and the elephant is just too cute!!! Thanks for sharing and for the inspiration! Enjoying the summer in Margaritaville. A new Design Team for me.